Oil painting by Swiss artist Ulrich Wilhelm Züricher (1877- 1961), of Martha Mühlestein. 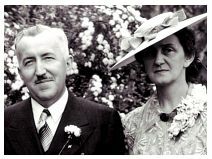 Emil Witschi married her in 1914. Cover of Witschi's book of children's stories, "Von Blumen und Tieren", Verlag E. Bircher, Bern, 1919. Richard B. Goldschmidt (1878-1958), zoologist and geneticist; and an important teacher, colleague, and friend of Emil Witschi. Goldschmidt was Richard Hertwig's assistant during Witschi's studies in Munich. 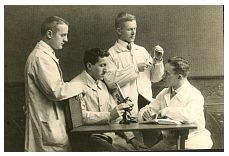 In 1922, as Director of the Kaiser Wilhelm Institute in Biology in Berlin, Goldschmidt hired Witschi as a research fellow at the Institute. Witschi family picnic. From the left: 4th, Hans Witschi; 6th, Harriet McCurdy Blanchard, one of Witschi's first graduate students; 8th, Marianne Witschi; 9th, Martha Witschi; 10th, Emil Witschi. Others are unidentified. What ARE they cooking? 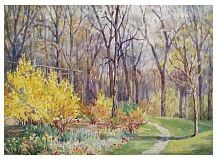 Garden and tennis court at Witschi home, 311 Woolf Avenue, Iowa City, Iowa. The artist is unidentified. From l-to-r: Martha Witschi, Emil Witschi, Harriet McCurdy Blanchard, at laboratory in Lake Okiboji, Iowa. 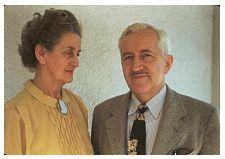 Prof. Emil Witschi and his wife Martha., at their home in Iowa City. At the airport, Iowa City. 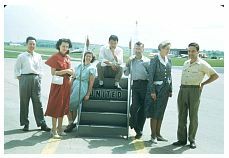 From l-to-r: Chih-Ye Chang, Joyce Bruner-Lorand, unidentified woman, Blacky Minimitsu, unidentified man, Martha Witschi, Sheldon J. Segal. Chiang, Bruner-Lorand, and Segal were students of Witschi. 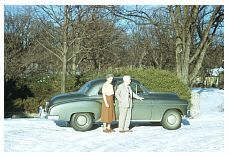 Martha and Emil Witschi at their home in Iowa City, Iowa, with their new Chevrolet Sport Coupe. Martha and Emil Witschi in their home, Iowa City, Iowa. Emil Witschi in his University of Iowa laboratory. The amphibian on Witschi's left arm is a male bullfrog. Witschi often used frogs and toads in his research, beginning with his 1913 dissertation. Martha and Emil Witschi at Charles Darwin's home, Down House, in Downe, England. Photo by Viktor Hamburger (1900-2001). Hamburger was an embryologist and endocrinologist, and friend of Witschi.